CELEBRATING 3 YEARS OF LA PELANGA AND ALL LIBRA BIRTHDAYS!!! 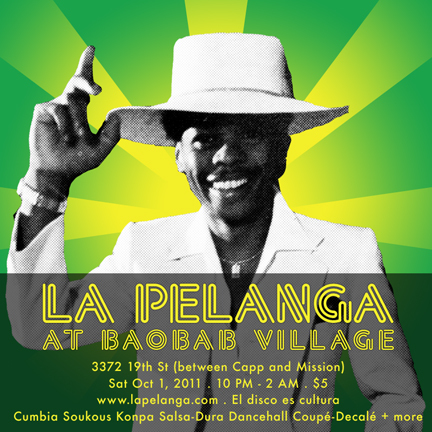 After an amazing year-long residency in the East Bay, La Pelanga returns to San Francisco’s Mission District—Baobab Village (3372 19th St) as we celebrate 3 years of La Pelanga. We are also celebrating the birthdays of our very own DJ China Tu Madre, DJ Posoule, subtextSTYLE, and all Libra birthdays. Your Pelangueros (DJs: China Tu Madre, Papicultor, Posoule and special guest, DJ Smokestack) will be serving up bubbling hot bailables straight from an actual food stand sound system. Come dance to musica sin fronteras as we handpick the most succulent sounds from Africa, Latin America and the entire Caribbean (Soukous, Merengue, Kompa, Cumbia, Coupé Décalé, Salsa, Dancehall, High Life, Soca and more). Over the past 3 years La Pelanga has developed into one of the most positive and progressive dance floor parties anywhere. And so we owe a massive THANK YOU to all those who have come out, supported and made this a celebration that continues to inspire. This entry was posted in PELANGA EVENTS by Jacobo (DJ Pozole). Bookmark the permalink.